Steve Smith-less Comilla Victorians will take on the Chittagong Vikings in the 14th match of the Bangladesh Premier League on Sunday, January 13 at the Shere Bangla Stadium. BPL 2019 Chittagong Vikings vs Comilla Victorians Match 14 Live Cricket Streaming And Updates: Steve Smith-less Comilla Victorians will take on the Chittagong Vikings in the 14th match of the Bangladesh Premier League on Sunday, January 13 at the Shere Bangla Stadium. Both the teams are somewhat on the same phase as they have won two off three matches and will face off to gain the lead in the points table. Earlier, Comilla Victorians faced a huge setback in terms of Steve Smith, who has departed back to Australia fan elbow surgery and will miss the rest of the tournament. Imrul Kayes will lead the team with Sri-Lanka allrounder Thisara Perera might be featuring in the team, who has come back from the New Zealand tour. The pick of the bowlers for Victorians would be Liam Dawson, who had a perfect start to the tournament. In his first match in the BPL last time out taking 2/17 from four overs. Meanwhile, local batsmen Yasir Ali and bowler Nayeem Hasan played a pivotal in team’s victory against Khulna Titans, which featured a super over and will be the players to watch out for Chittagong Vikings. What time does the Chittagong Vikings vs Comilla Victorians match in the BPL 2019 starts? The Chittagong Vikings vs Comilla Victorians match in the BPL 2019 starts at 06:00 PM IST, January 13 (Sunday). Where is the Chittagong Vikings vs Comilla Victorians match in the BPL 2019 being played? Which TV channels will live broadcast (in India) the Chittagong Vikings vs Comilla Victorians match in the BPL 2019? The Chittagong Vikings vs Comilla Victorians match in the BPL 2019 will be live broadcast on DSport in India. How to watch the free online live streaming of the Chittagong Vikings vs Comilla Victorians match in the BPL 2019? The free online live streaming of the Chittagong Vikings vs Comilla Victorians match in the BPL 2019 will be available Youtube. 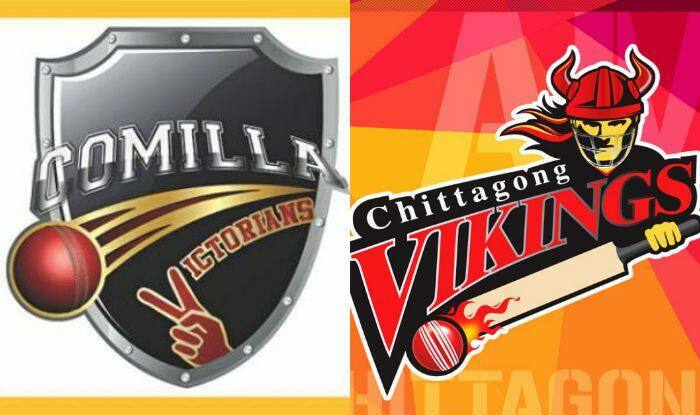 What are the probable playing XIs of Chittagong Vikings vs Comilla Victorians match in the BPL 2019?